Ninja Spirit is a fast paced action game set over multiple levels in ancient Japan. You have a choice of four weapons, switchable at any time using the Select button, each of which has multiple stages of power, increased by collecting certain scrolls dropped by orange ninjas. Your katana can slash in four directions (useful when sneaky ninjas are trying to stick a spear in you from below), shurikens are rapid fire and have a wider spread as power increases, bombs are slower to fire but do more damage, and finally the sickle and chain is deadly, allowing you to spin it around yourself in an arc of devastation. 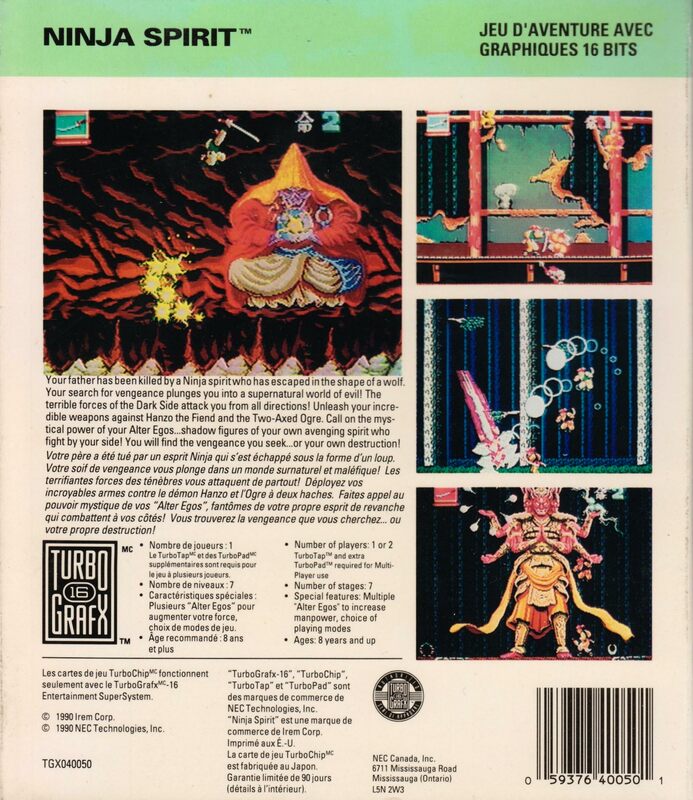 But the unique feature to Ninja Spirit are the platform versions of Gradius’ Options - ghost ninjas that mimic your moves and add greatly to your offensive damage. 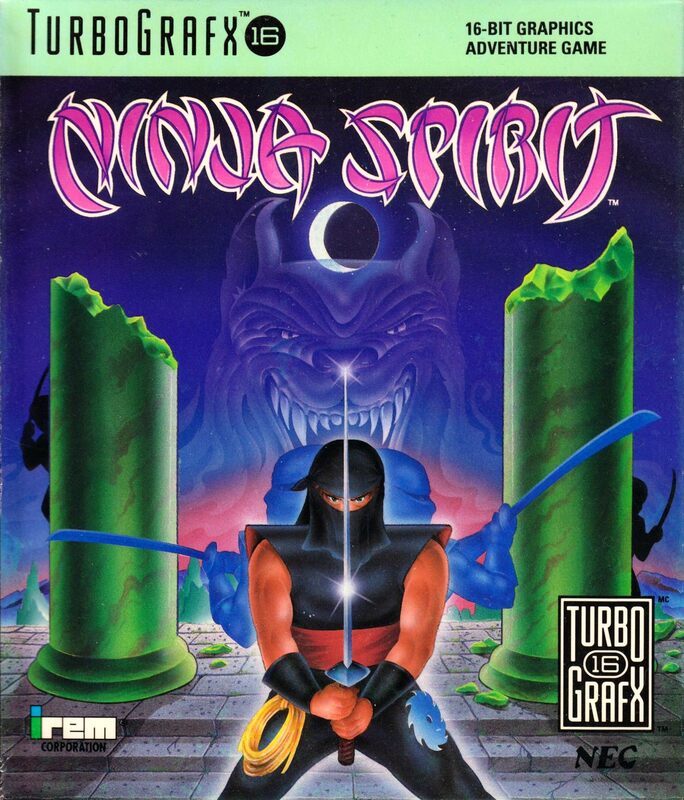 Ninja Spirit is quite a blast to play. The action is speedy and quite intense at times, although it can suffer from some quite bad slowdown which diminishes the experience slightly. 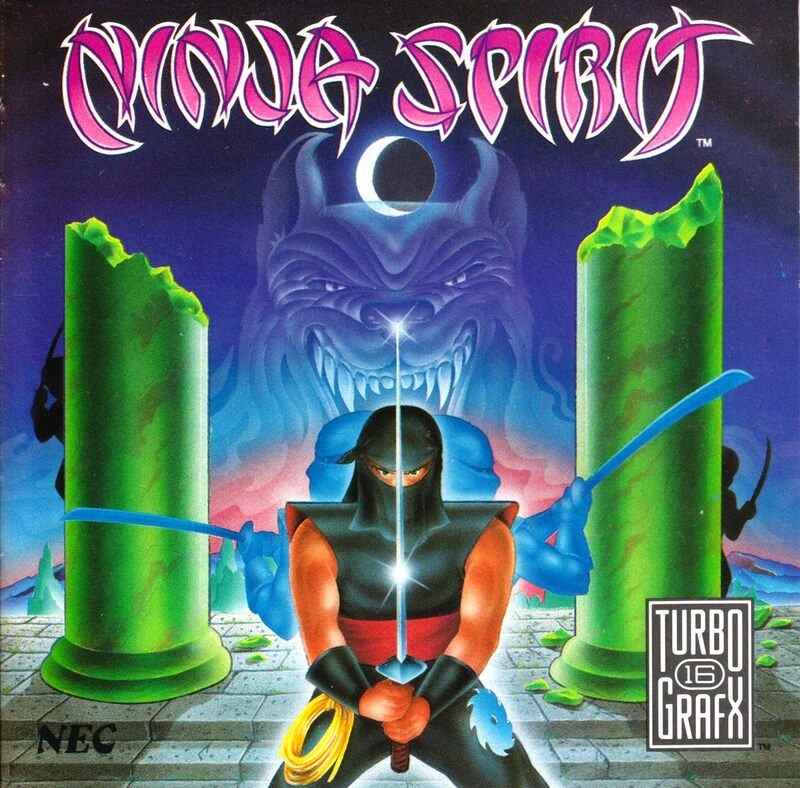 The ghost ninjas are very handy, quite easy to obtain, and they give you a real satisfying sense of power as you plough through the many enemies on screen. The weapons give a slightly strategic element to the gameplay - there are times when choosing the right weapon will make your life considerably easier. 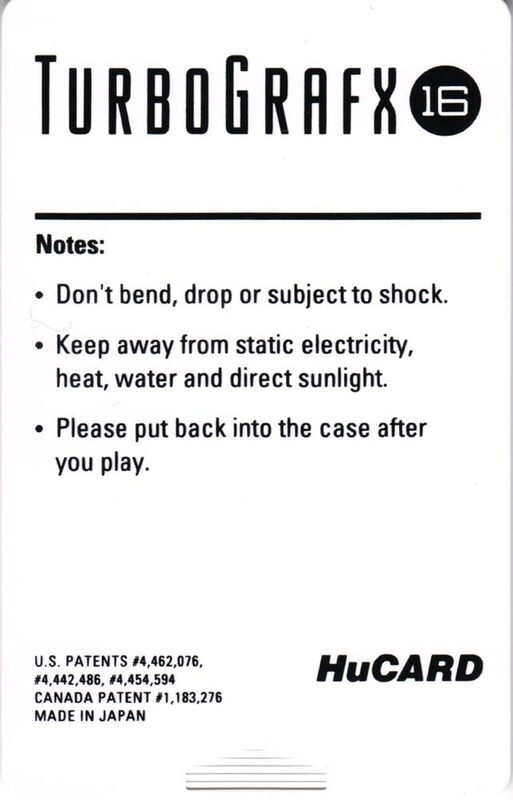 Speaking of which, this conversion contains both an arcade mode and a PC Engine mode, the difference being the multiple hits you can take before dying in the PC Engine mode opposed to the arcade’s one-hit-and-you’re-dead. Graphically, it’s really quite an atmospheric game. Both background graphics and sprites are nicely drawn and there are a few places with a clever dual-playfield parallax scrolling effect, which despite using quite simple pattern blocks is very effective. Sound is unfortunately less good. 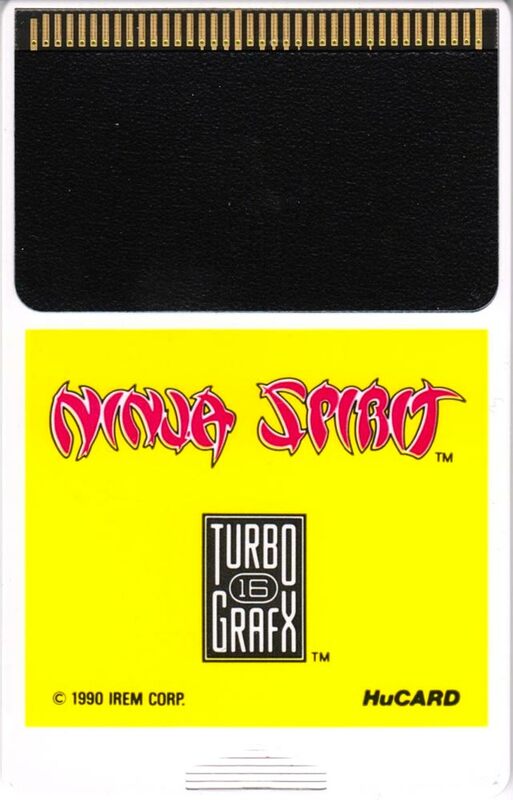 As with most Irem games, it suffers from that kind of icky, weedy Irem music, although given the mass of sound effects going off, you never really notice it. It’s certainly a better ninja-action game than Shinobi or Kaze Kiri, and well worth adding to your collection. 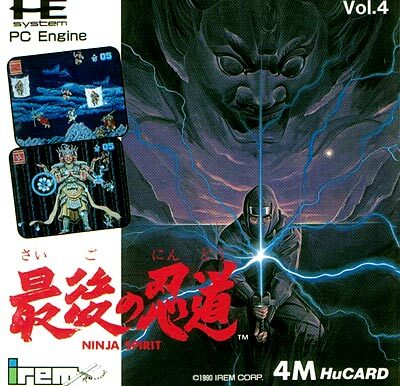 Ninja Spirit was an early coin op conversion by Irem, released on the PC Engine 2 years after the games 1988 Arcade debut. Despite being released early in the console's life, it shows a mastery of the Engines palette. The colours are spot on for the broody, atmospheric look of the game, and some of the spritework is quite lovely. The game itself is a quick almost run and gun platformer that sees you move from left to right, dispatching enemy ninja until you get to the obligatory boss. But it has some neat ideas thrown in there too. You can gain power ups, notably in the form of "shadows" of your character, that follow you and effectively double and triple your firepower. There's also a lot of verticality in this game, there are often platforms high into the screen, and your characters excellent jumping control means you'll spend a lot of time in the air. There are also enemies which attack from above, just to keep you on guard. The last thing to mention, is that unlike other straight arcade ports, this one features both an arcade-accurate one life-one hit mode, and a slightly easier version where you can take multiple hits. This is a good call, since Arcade games are designed to take your money, and home console games of the time were starting to trend away from high scores, and towards things with a finite ending to be reached. Good call Ninja Spirit.